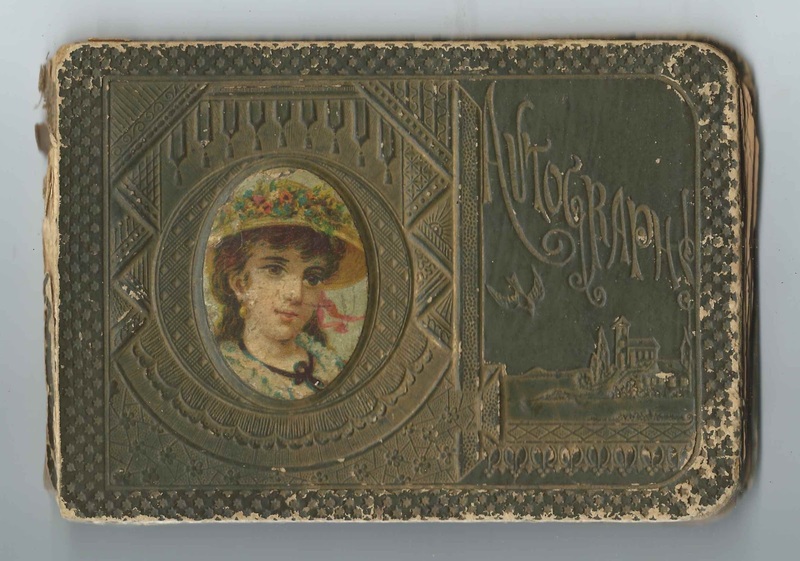 1890s autograph album of Helen Brooks of Schodack, New York. She may have been Ellen C. Brooks. Several of her siblings and other relatives inscribed pages in the album. 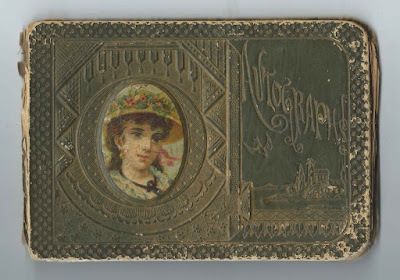 The album measures approximately 6-3/4" by 4-1/2" and contains the sentiments of 44 of Helen's relatives, friends and schoolmates. An alphabetical surname list and an alphabetical list of the inscribers, together with any personal information they offered, appear at the end of this post. On a bittersweet page a note was added, presumably by Helen herself, to indicate that the inscriber, Fannie Barringer of South Schodack, had died. 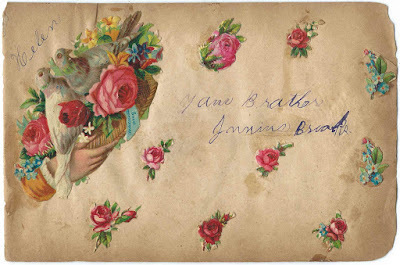 Fannie inscribed her page on September 15, 1891. 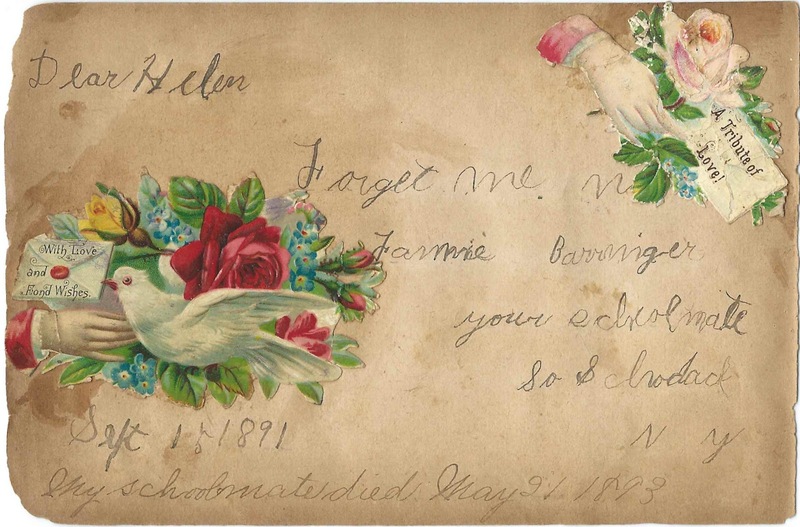 The note indicates that she died on May 21, 1893. Helen Brooks was born June 24, 1879 at Schodack, New York, the daughter of Jacob H. Brooks and Laura M. (Collins) Brooks. Helen's father, Jacob H. Brooks, the son of Abraham and Elizabeth (Hogeboom) Brooks, may have had a first marriage to Rosa Craigin, daughter of Andrew F. and Margaret (Cleary) Craigin; they possibly had two children together. Rosa died April 30, 1871. Hopefully a reader will weigh in with definitive information. On November 2, 1872, Jacob married Laura M. Collins, daughter of Joseph and Mary B. (Worth) Collins. I believe Jacob and Laura had seven children together, but, again, I'd be interested in hearing from a reader. Several people from the Collins family inscribed pages in Helen's album. 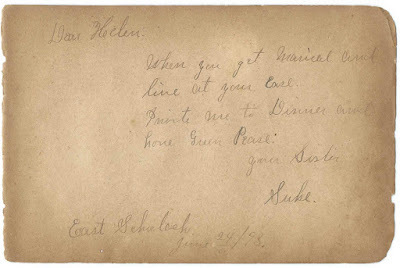 Helen's sister Suke of East Schodack, New York, inscribed a page on June 24, 1893. 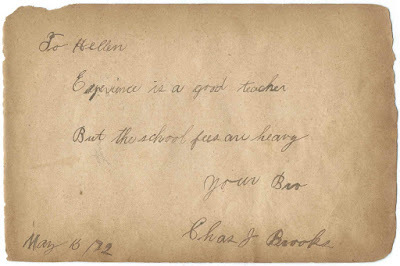 Helen's brother Charles J. Brooks inscribed a page on May 15, 1892. 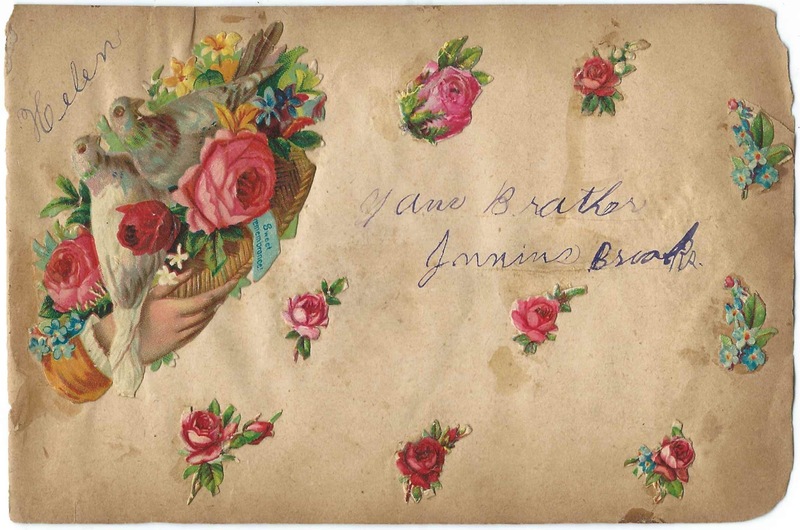 Helen's brother Junius Fallon Brooks inscribed a page. 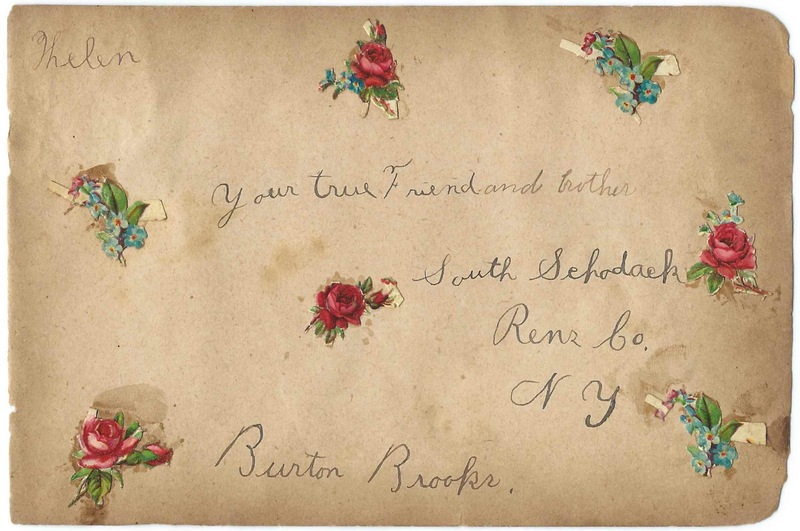 Helen's brother Burton Brooks of South Schodack, New York, inscribed a page. 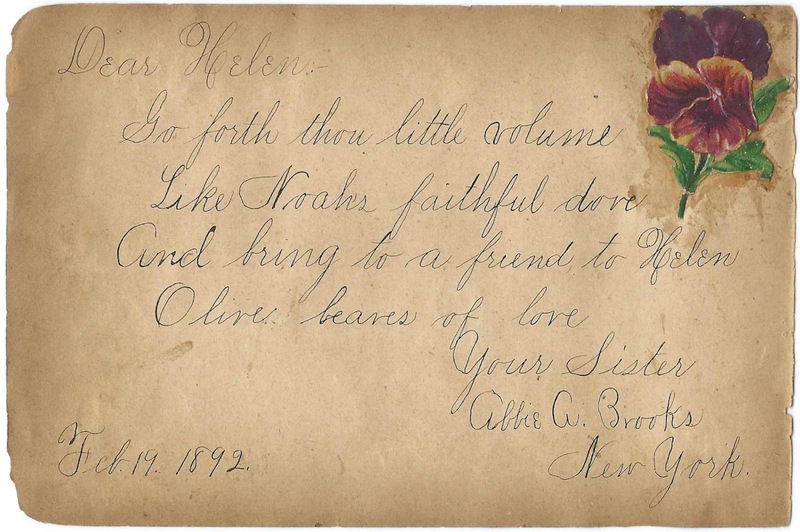 Helen's sister Abbie Amelia Brooks inscribed a page on February 19, 1892. 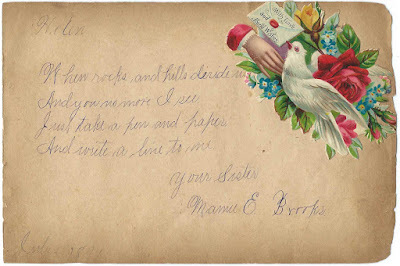 Helen's sister Mary E. Brooks, "Mamie", inscribed a page in July 1891. Many other inscribers indicated a family relationship with Helen, as you can see from the list of inscribers below. Among them were Helen's great aunt Abbie M. White of Muitzesville, New York, and great uncle George B. Worth. Before 1910, Helen married Fred Higgins, son of David and Sophia Higgins. Fred was born about October 1881 in New York. I believe Helen and Fred had at least three children. Fred died in 1958, but I haven't found a death record for Helen. Fannie Barringer, inscribed at South Schodack, New York, on September 15, 1891; Helen's schoolmate. 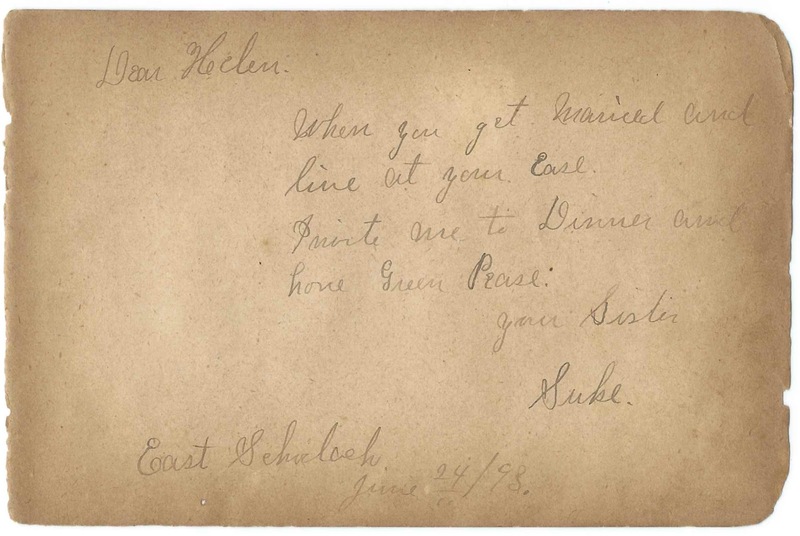 Sadly, someone, presumably Helen, added a note: "My schoolmate died May 21, 1893"
Helen Brooks of Schodack, New York; album owner. 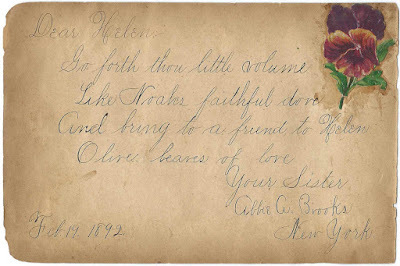 Helen Brooks was my great, great grandmother. She was married to Fred Higgins and had a son, Emerson Higgins who was my grandfather. My mother was Phyllis Helen Higgins and is now 81 years old. I would love to have this autograph album. I have the complete geneology proving the ancestry required for the Sons/Daughters of the American Revolution. I am a direct descendant of Barzillai Folger who was a patriot of the revolutionary war. Glad you happened upon this post and that you now have the album!